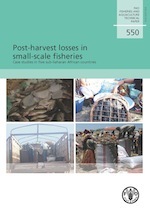 FAO Fisheries and Aquaculture Technical Paper. No. 550. Rome, FAO. 2010. 72p. of Conduct for Responsible Fisheries. African countries (Ghana, Kenya, Mali, United Republic of Tanzania and Uganda). identified – and quantified by researchers using three assessment methods. the rainy season when poor drying conditions prevail. and continued technical and policy initiatives by international and national agencies. used regularly to inform policy.